Ok. I always seem to start with an apology for taking so long to update. I am constantly writing entries in my mind and never seem to be able to get them down in writing. Everything changes so quickly and so constantly that most of the time I'm just trying to "stay in the rollercoster", instead of being dragged behind, banging along the tracks, as my dad would say. So much has happened since my last post. I think that with Neuroblastoma, the only certainty is that nothing is certain. Anything and everything can change so quickly that there is no time to truly absorb and process, only to accept and move forward. Always forward. With a smile. Even when you feel the ground crumble beneath your feet, you smile. You smile for your child. You smile for those around you. You put on your "everything is great" mask and you smile. And you move forward. 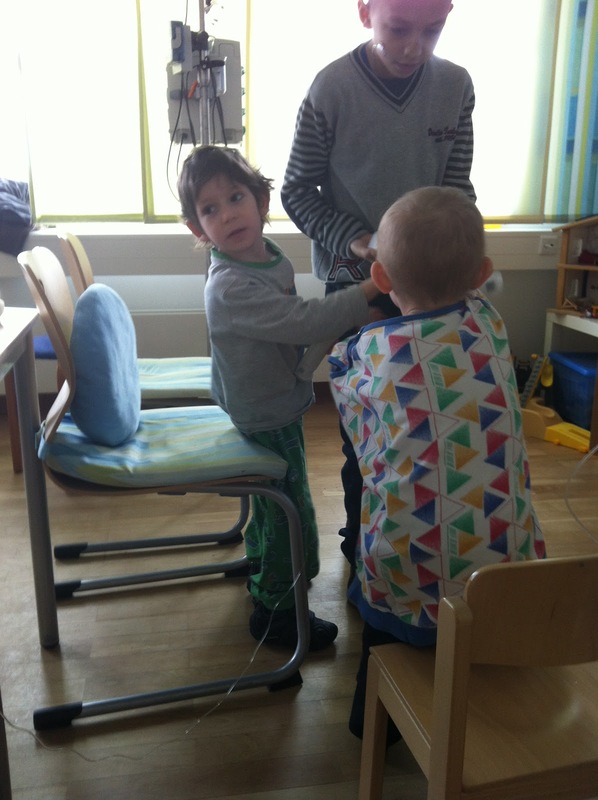 Alejandro, Carlos, Dani and I arrived in Griefswald on January 1st to begin the second round of antibody treatment. With the first IL2 injection on Monday the 2nd, Alejandro started having pain in his left leg. The pain worsened as the week went on. On day 2 he was already walking with a pronounced limp. During the first couple of days the Drs. were pretty certain it was inflamation from the IL2 that was compressing the nerve that runs through the foramen where Ale has the tumor. But by midweek, Prof. Lode saw Ale walking in the hallway and ordered an emergency MRI for that Friday- the same day Dani and Carlos returned to Barcelona for work and school. And there it was. The tumor, that had remained stable for almost a year, had progressed. And since that Friday things have moved so fast that the first of the year seems like a lifetime ago. Ale immediately began the German RIST chemotherapy protocol. This is a combination of alternating weeks of oral Rapamucine and Sprycel with IV Irinotecan and oral Temozolamide (for those of you who understand what I'm talking about). While he began the treatment, the Drs. did a complete restaging. MIBG confirmed the findings of the MRI but at least showed that the small lesion in his thorax was gone and there was no metastisis outside the progession at the relapse site. 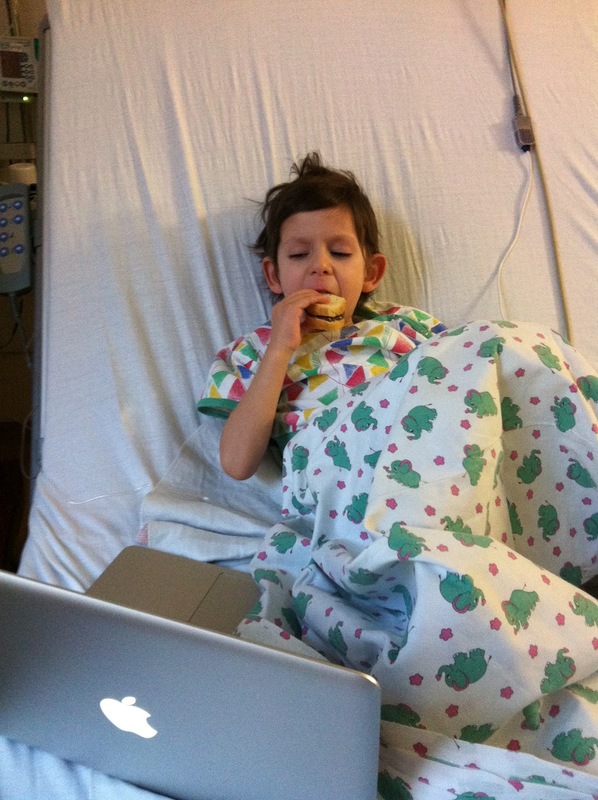 Alejandro also simultaneously completed the IL2 and 7 days of immunotherapy. To make a long story short, the possibility of a surgical intervention was discussed and the surgeons here felt they could resect the tumor in the sacrum, which now was occupying part of the spinal canal, by going in through the back and removing part of the sacrum. For this part of the surgery we would have the head of neurosurgery. And in the same procedure, they would then turn Alejandro and proceed to perform his fourth laparotomy and remove any tumor remaining in the presacral area, this done by the head of pediatric oncological surgery. We spoke to our oncologist back in Barcelona and she agreed that the situation was now very different from the one we had back in November. The idea was, of course, to resect the tumor, but now there was a risk of permanent nerve damage the longer we waited. More testing was done. Visits to the neurology department were made to have baseline information before surgery and on Februrary 2nd Alejandro underwent a 12+ hour surgical intervention to remove the tumor. The funny thing is, and it is really not funny at all, that the riskiest part of the procedure went incredibly smoothly and was a complete success. they were able to remove all of the tumor from the foramen and spinal canal and decompress the nerve. However, what was supposed to be the "easy" part of the surgery turned out to be impossible. After carefully going in from the front to finish removing any remaining tumor, what the surgeons found, instead of tumor, was NB dispersed in the sacral plexus and invading a nerve sheath. The latter is what had appeared on imaging as an elongated piece of tumor. They have never seen a NB presentation like this before and there was nothing they could do, surgically. They had called the neurosurgeon back in to evaluate, but he confirmed that if they proceeded to resect the entire "pack" of nerves within the sheath, the consequences for Alejandro would be unacceptable. And so, Alejandro is now free of his unresectable sacral tumor, the sciatic nerve has been decompressed and may regain full function, but he has Neuroblastoma disseminated in his sacral plexus and invading a nerve sheath. We spent a week in intensive care and another 2 weeks in-patient on the onc ward so that Ale could begin the oral part of RIST without wasting any time, and then move on to the Irinotecan/Temozolomide. He also began physical therapy and goes every day Monday-Friday. The therapist is amazing and has a great relationship with Alejandro- even though they don't speak the same language he understands her and trusts her and actually does what she says. I wish I could be so lucky! And, basically, the plan for now is to complete two phases of RIST back to back. Phase I= 8 weeks of treatment alternating Rapamucine/Sprycel with Irinotecan/Temozolomide on a weekly basis, and Phase II=2 weeks Rapamucine/Sprycel, 1 week Irinotecan/Temozolomide and so on for I'm not sure how many weeks. We would then move on to local radiation therapy and MIBG therapy. In about 3 weeks we will be done with Phase I and undergo restaging while starting Phase II. So, if there are no new surprises- there just can't be- this wil be the new plan. Our oncologist in Barcelona is willing to work with the Drs. here in Germany, so I hope we will be able to return home soon. We came for two weeks and now we have been here two months. But Alejandro seems to be handling it ok. I know he's frustrated that he's still feeling pain in his leg and it's difficult for him to walk, but he's up and about as much as he can. We even kicked a ball around in the hallway at the hospital the other day. It will take a lot of P.T. to get his leg back in shape (in the event there is no permanent nerve damage- if there is we will also find a solution) and Ale is not interested in waiting. Carlos, as always, is the best medicine and his presence alone is enough to get Alejandro up and walking. Dani came back for the surgery and now both Dani and Carlos have come to spend the weekend. It's so incredibly good to be together the four of us and will be so so incredibly sad when Dani and Carlos have to go back tomorrow and we have to stay behind. Yet somehow I've kept myself going. There were the dreadful 24 hours right after surgery, when we had to hear the surgeons report, that I thought that this time I wasn't going to be able to do it. It lasted just that. Or not even, come to think of it. Somehow. Somehow we keep doing it. It just happens. You go on. You breathe. Clean your face. Paste that smile back on your face, and you go on. Your strength and grace in the face of this journey is amazing! You guys are always in our thoughts and we are wishing Alejandro great success in this next phase. Wishing Alejandro and all your family the very very best. Keep doing what you're doing, keep believing. Alejandro could not have better parent advocates to get him through this. All our kids fighting this disease are made of the most unbelievable stuff ... and they had to get that from somewhere, didn't they?